Psypoke - View topic - What was most frustrating for you in Sinnoh? What was most frustrating for you in Sinnoh? Re: What was most frustrating for you in Sinnoh? I think you have it pretty backwards. GSC only seems "lonngg" because it had two regions in it. Even WITH two regions and sixteen Gym Leaders, it's still a pretty common consensus among fans that GSC was the easiest generation in difficulty. Also, the regions aren't getting smaller because Johto was the smallest one of them all and Kanto wasn't much better (especially not in GSC!). There was also literally nothing to do in some of the older games after beating the Elite Four but DPP at least added a whole bunch of sidequests and optional areas. The lack of fire types did not bother me, my friend gave me his chimchar. I think the most frustrating thing for me in Sinnoh was getting through the Team Galactic HQ Base. So many portals, I can't tell where to go. So I ended up battling everyone. That would have to be breeding, seeing as the frustration just happened today. I was exp share training my ralts in the veilstone gym, and just after I beat Maylene I see tht Confuse Ray, (the move I spent hours breeding onto a male ralts with a decent nature) is suddenly......gone. Since my Ralts was lvl one when I went in, and I saved RIGHT before the gym leader it leads me to say a very definite ^!@%^$%^%@!$!! In Daimond & Pearl, getting a good streak in the battle tower & evolving buneary as I went through the adventure on my first Daimond file. In Platinum, the Battle Factory's Level 50 setting once I finally got to Thorton only to be way out matched due to garbage pokemon...& of course the out of the blue battle against Cyrus in Celestal Town, it was truly a pain! There's a few things dat I could mention dat was da most frustrating. But, im not gon reveal all of da moments! If i could, I would say gettin through da time & space vortex world to capture Giratina in Platinum was da most frustratin moment for me. It was like da only time dat I actually had to review da walkthrough! The concept of Honey Trees. The very thought of finding that single tree that held a one percent of chance of holding a munchlax was enough to make me cringe and wish things were still simple like they were for feebas; at least that was straight forward enough if you knew what to do. No, finding a wild munchlax is just another Mirage Island. Last edited by Shrilakkigan on Fri Mar 05, 2010 11:16 am, edited 1 time in total. Lack of difficulty & Game length. All gym leaders should push you to the limit. They should also add eight pokemon contest battle tents, set them up just the same as gym battles. I would of also liked to see less type combination & more single type pokemon. Just getting around was a pain in DP. Too many obstacles in too many areas with the encounter rate set too high. I usually buy both games in a generation so that I can use one as a TM/item generator while the other is my "home" game, but I've held off on buying Diamond just because of this issue. Also, the story was a little lame. Call me a loser for caring, but after Emerald - hell, after LGFR - the Galactics seemed an ill-defined enemy with vague, unstated goals whom you fought just because they were there. Also, I wouldn't consent to wear the Galactic uniform for, what, like two week's pay, whereas I'd pay twice that amount myself for a well-made Rocket, Magma, or Aqua costume. What? It frustrates me that I can't bring the sizzle while cosplaying the bad guys. Don't give me that look. For me, it was their God-forsaken hair! Gah! I absolutely hated it. They were like Capt. Spock from Star Trek or something. It also does seem like you fight them just because they are there, but at least in Platinum the detective guy tells you to look out for Team Galactic. lol, they were like star trek characters. and their pokemon were the weakest ones i have ever battled. 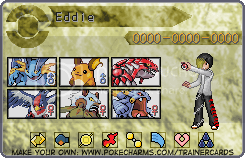 lol, i had more trouble with brock back in the day with red version, then i did with cyrus, now in the sinnoh region. XD that should NOT happen. the first gym leader was more powerful then a psychotic pathetic excuse for an evil mastermind trying to recreate the universe? i rofl. Location: Waiting for the next ship to the Unova region! My biggest probelm with all the games, especially Sinnoh, is lack of fire types! There's always loads of Water & Grass types out there to catch, and no fire types! I always get Fire type starters now, simply because there aren't enough substitutes for them. Thanks go to pokemon_god for the awsome banner & avatar! nd Mektar for The Trainer Card! there also arent very many poison types, but poison isnt a main type like fire. I think most of us agree that the lack of Fire-type Pokemon has been, if not, one of the most frustrating problem in DPP. another thing frustrating - i didnt get a mew in it. i have never gotten a mew, ever, rofl. so i was hoping they would have an in-game thing where you could catch a mew. not a nintendo event, which i totally missed. *sigh* it will never happen, though.